High Peaks Pure Earth has strayed from the usual material and this time translated an article by Party Secretary of the Tibet Autonomous Region (TAR) Chen Quanguo that was published in the primary theoretical journal of the Central Committee of the Communist Party “Qiushi” (literally meaning Seeking Truth) and was posted online on their website on November 1, 2013. The article is a commentary on a speech made by China’s President Xi Jinping on August 19, 2013 at the National Propaganda and Ideology Work Conference. Media reports about this speech honed in on Xi’s “combative” approach towards media in order to “wage a war to win over public opinion” as well his order for the “propaganda apparatus to form a strong internet army to seize the ground of new media”. Chen’s article reflects Xi’s speech while focusing solely on TAR and has already attracted a fair share of media interest such as this Reuters piece of November 2, 2013 titled “China says will stamp out Dalai Lama’s voice in Tibet” and see also this round-up by China Digital Times. The media reports focus mostly on the part of the article where Chen stressed the need to prevent the influence of the Dalai Lama by preventing the distribution of the Dalai Lama’s images, speeches and writings on the internet. In closer reading of the article, the article is interesting in gauging existing policies and practices in the TAR. Chen’s article could be an indication of strategic positioning by Chen Quanguo, who was appointed TAR Party Secretary in 2011 under Hu Jintao. 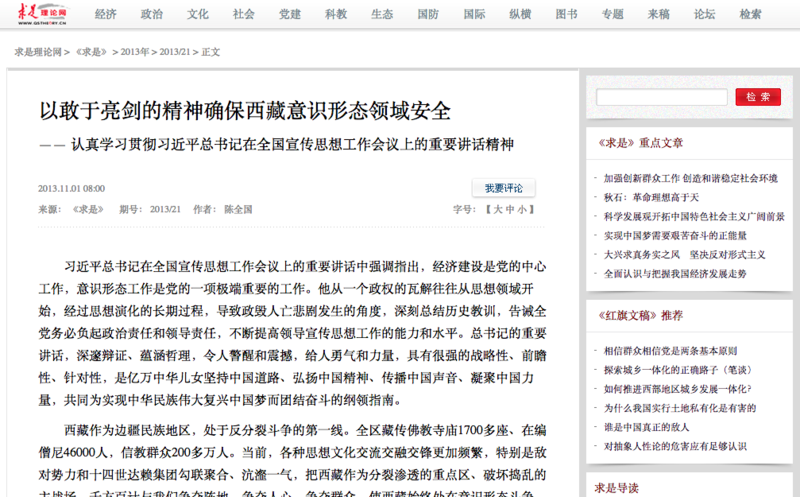 Chen’s article begins by endorsing Xi Jinping’s August Speech and adopts the “Chinese Dream” slogan coined by Xi Jinping to replace Hu Jintao’s “Harmonious Society”. By using the same language and guidelines established by Xi Jinping, Chen and the TAR Regional CCP are demonstrating their allegiance to Xi and the new leadership. Despite the anti-separatist and ideological struggles mentioned in the article being nothing new when it comes to CCP policy in TAR, Chen’s article contains a considerable amount of information about his approaches to both traditional and new media, fields that High Peaks Pure Earth are particularly interested in. It’s commonly known for example that the Chinese government employs an army (50 cent army) of netizens to write comments on websites and social networks and in his article, Chen states his intention to utilise the “vast Party and Youth League members to establish a contingent of websites commentators, who are politically reliable and who are good at using website language”. It looks as though Chen wants websites to replicate the structure of a work unit (danwei) in that “CCP branches should be established at all websites”. Xi Jinping, the General Secretary, emphasised and pointed out in his important speech at the National Propaganda and Ideology Work Conference that economic construction is the central work for the CCP, and the ideological work is very important work for the CCP. He warned that the entire Party should shoulder the political and leadership responsibilities to continuously raise the ability and level of leading propaganda and ideology work. As an ethnic border region, Tibet is at the forefront of the anti-separatist struggle. At present, the exchanges, mingling and contestation among various ideology and culture have become more frequent, in particular, the hostile forces have colluded with the clique of the fourteenth Dalai Lama, and have considered Tibet as a key area for infiltration and separatist activities and as the main battlefield for sabotaging and causing disturbances. They have tried all means to contend for the battlefield, popular feeling and the common people, thus, all their efforts have made Tibet the teeth of the storm in the struggle of the ideological realm. Therefore, we have fully realised the extreme importance and urgency of strengthening the work of the ideological realm. We should not slack our efforts to strengthen the work of the ideological realm and truly shoulder the important political responsibility entrusted to us by the Party and the people. To vie for the control of the commanding point: Strengthen the work of the ideological realm by intensifying the “responsibility” with the spirit of having the courage to shoulder one’s responsibilities. Party committees of various levels should place the work of ideological realm on the important work agenda, forming the leadership working team of ideological work with the Party Secretary as the head and establishing the system of regular meetings. We should strengthen the political responsibility of the “Chief” of Party Committees of various levels, requiring them to lead the work and face the challenges directly. They are required to take the lead to listen to and watch state media as well as the local Party newspaper, the local radio station and the local TV station. They should also take the lead to control the orientation of the local media and the public opinion. To firmly control the “two battlefields”. We should always adhere to the principle of the Party’s controlling of the media, always persist in having politicians run newspapers, to be in charge of journals, radio stations, TV stations and news websites. We should also adhere to the main principle of propagating the main themes and spreading positive energies. On the one hand, we should firmly control the “battlefield” of the traditional media. We should strengthen the principle and policy of publicising the Party’s theories and lines, firmly publicising the care and concerns for people of various ethnic groups in Tibet bestowed by the Central Committee of the CCP headed by Comrade Xi Jinping. We should persist in disseminating the earth-shaking and tremendous changes that have occurred in the new socialist Tibet and publicising the new stable, peaceful and happy life of people of various ethnic groups in Tibet. We have to ensure that the content of reports are on important pages of newspapers, at important radio frequencies and in the golden time slots on TV should not be less than 95%. Meanwhile, we should move our focus downward to the grassroots level by strengthening the rate of coverage and the actual effectiveness of dissemination of Tibet TV station, Tibet Radio Station, People’s Daily, Tibet Daily and others. On the other hand, we should also firmly control the “battlefield” of the newly emerged media. A Party working committee in charge of the work of internet to be headed by the Deputy Party Secretary of TAR should be formed, and CCP branches (CCP groups) should be established at all websites which have conditions to do so. As for those websites which do not have conditions to establish CCP branches, we should dispatch two or three political instructors to be in charge of Party construction, realising our goal of “complete coverage” for the Party construction at websites in the entire region. We should speed up the process of improving and perfecting the internet information office of three levels, including Autonomous Region level, Prefectural (Municipal) level and County (City and Township) level, strengthening the control over the information management of websites and actively engaging in propaganda on websites and in the struggle for the control of the public opinion on websites. We should speed up the process of establishing a network TV station of Tibet and run such important news websites as China’s Tibet News Website and the website of the Voice of China’s Tibet efficiently and well. We should speed up the process of promoting the establishment of Tibet channels or Tibet websites in mainstream domestic websites so as to make Tibetan cyberspace more clear and bright. Construct and strengthen “Three Contingents”. We should establish a contingent of propaganda, ideology and culture, who are loyal to the Party, to the motherland and to the people. We should strengthen the training for cadres for propaganda, ideology and culture, appointing a full-time propaganda committee member for each town. We should put forth an effort to train a group of excellent propaganda cadres, who are politically reliable and who are in complete mastery of their professional work. At the same time, we should also train a group of news interviewing and editing staff, who are devoted to their duties, who love their positions and are dedicated to their job and who are moral and noble. Furthermore, we should train a contingent of cadres in charge of propaganda on websites and the control and management of websites, whose standpoints are steadfast, whose reactions are fast and who are trustworthy. To continuously increase the positive voices on websites, we will rely on the Party and Youth League organisations of various levels and the vast Party and Youth League members to establish a contingent of websites commentators, who are politically reliable and who are good at using website language. We will also depend on the contingent in charge of website security of public security forces to establish a contingent of website police force, which is in complete mastery of their professional work and whose reactions are fast and timely. We will build a contingent of intellectuals with high quality, who are obedient to the Party, who are grateful to the grace of the Party and who follow the Party. We will strengthen the education, care and training of the intellectuals, putting forth great effort to train a group of core members for Marxism education, whose political standpoints are steadfast and whose professional quality are high. To ensure that they will unite around the party in the greatest degree, we should establish a system of communication and networking for such special groups as leaders of website opinions, network writers, contracted writers, freelance writers, independent actors, actresses and singers. Strengthening the “Four systems”. Strengthening the system of positive propaganda and guidance. The propaganda departments and offices of various levels should take the initiative to choose topics to arrange news publicity, establish the system of news liaison personnel so as to expand the coverage for positive propaganda. Furthermore, we should strengthen the system of responding to emergencies. We should also speed up strengthening the platform of monitoring social and public sentiment, understand the trend of important public opinion on time and conscientiously guide the public opinion of emergencies. We have to strengthen the leadership system of being co-administered by relevant government functional departments. We should foster the concept of “great propaganda” and implement the supporting policy for steadily increasing the investment of public finance. The work pattern of the unified leadership by the Party Committee, the division of labour and co-operation among the various functional departments and participation and support by the entire society. The system of supervising, rewarding and punishing should be strengthened. We should praise and reward working units and individuals who have implemented the policies of the central government, have conscientiously publicised the central work of the TAR Party Committee and TAR People’s Government, whose effectiveness of propaganda is great and whose contribution is outstanding. Meanwhile we should punish those who have violated the disciplines for news reports and whose orientation of propaganda is erroneous. We should adhere to the principle of guiding people with ideals and beliefs. Ideals and beliefs are just like “calcium” for Communists. We should combine our efforts to study, publicise and implement the series of important speeches made by the General Secretary Xi Jinping as well as our effort to study the socialist theoretical system with Chinese characteristics with the gist of the Eighteenth Party Congress. We will compile a book (in both Tibetan and Chinese) consisting of important speeches made by the General Secretary, the editorials and the reviews, and will issue a copy to every cadre who is a Party member so that he can study it carefully. We should also allow cadres stationed in villages, cadres stationed in monasteries, the head of two friendship families and cadres’ effort to assist one’s friendship family in rural regions to play their role in publicising the gist of important speeches made by the General Secretary. In doing so, the speeches will be known to all and impress deeply in everyone’s mind. We should also promote the project of studying and constructing Marxism, and co-operate among various government functional departments to establish “the Research Base of Key Reality Issues in Tibet of the Chinese Academy of Social Sciences”. We should have Marxist theories as one of the core required courses for Party schools of various levels (College of Administration), which should account for over 60% of the total class periods. We should also draft and put into effect “The Suggestion of Strengthening the Ideological and Political Work in Colleges and Universities”, and compile textbooks for ideological and political education in six universities and colleges in TAR so as to ensure Marxism, the history of the CCP and history of our country will be included in textbooks, in classes and in people’s mind. We should adhere to uniting people through the “Chinese Dream”. We should carry out “the Great discussion of the Chinese Dream”, “Fulfilling the Chinese Dream” and implement the “Chinese Dream – Five Actions of Civilising Tibet”. We should interview and edit a series of news reports titled “The Chinese Dream – The Story of Tibet”, and film the documentary titled “The Chinese Dream – My Dream”. We should explain and publicise the TV documentary and thematic public service announcements to the people. We will also publicise the deeds of 100 model workers who are dedicated to their work in the activity entitled “Chinese Dream – Starting from me”. This will enable the people of various ethnic groups to thoroughly understand, to realise the Chinese dream, one must follow China’s path under the leadership of the CCP, propagate the spirit of China, coalesce the power of China. They should more thoroughly understand the intrinsic relationships among the dream of the country, the dream of the nation and the dream of individuals. We should adhere to affecting people with thematic activities. We will thoroughly carry out patriotic education. We will focus on unearthing historical relics revealing the administration and rule of Tibet by the successive central governments and “red” historical remains. We will take full advantage of the dominant position of the patriotic education base, and we will sing loud and clear the melody of “The CCP is Good”, ”Socialism is Good”, “Reform and the Open-Door Policy is good”, “The Great Motherland is Good” and “People of Various Ethnic Groups are Good”. We will thoroughly carry out educational activities focusing on core values with such themes as patriotism, unity, harmony, development and civilisation. We will actively promote the core values to be introduced into government institutions, enterprises, villages, local communities, schools, military camps and monasteries so that the core values will deeply take root in the minds of people of various ethnic groups in the entire Autonomous Region. We will thoroughly carry out the educational activities of comparing Old Tibet with the New Tibet, instructing people of various ethnic groups to be grateful to the Party, listen to the Party and follow the Party. We will thoroughly carry out the activity of national unity and progress. We should persist in observing “March 28” the anniversary of the liberation of Tibet’s million serfs and engaging in a month of publicising national unity in September. Each year we will convene an assembly to commend the actions promoting national unity and progress, and will continuously consolidate the great situation in which various ethnic groups live harmoniously together, are united and work in concert and develop harmoniously. We will persist in inspiring people with “the spirit of Old Tibetans”. By means of holding seminars and symposiums of publicising model deeds, we will thoroughly unearth the rich connotation of “the spirit of Old Tibetans”. We will spare no effort to propagate the excellent tradition of “lack oxygen but do not lack spirit” and will endow the tradition with new characteristics of the time. We will be able to pay special attention to politics, be able to be especially innovative, able to endure hardship, able to especially shoulder responsibilities, able to especially make contributions. Thus, we will be able to have “the spirit of Old Tibetans” shine on the Tibetan plateau. We should resolutely carry out the struggle against separatist activities. 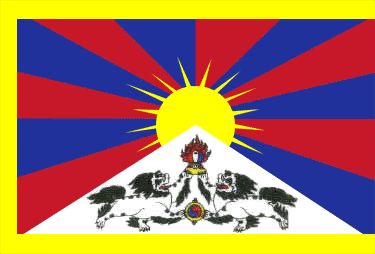 By means of exposing and critiquing separatist activities via theories, refuting with public opinion, publicising and explaining policies as well as expounding by using one’s own experience as example, we should thoroughly expose and criticise the wrongdoings of the fourteenth Dalai lama’s clique, including the reactionary nature of their politics, hypocrisy of their religion, deception of their tricks. We should also thoroughly expose and criticise the Dalai Clique’s reactionary scheme of the so-called “Middle Way”, “Greater Tibet” and “high degree of autonomy”. We should educate and guide cadres and ordinary people of various ethnic groups to separate Tibetan Buddhism from the fourteenth Dalai Lama, and separate the fourteenth Dalai lama from the title of the Dalai Lama so that they will consciously make a clear break from the fourteenth Dalai Lama’s clique. Their standpoint in the important political principle like the anti-separatist struggle is firm and will be highly consistent with standpoints of the Central Party Committee. We should resolutely resist infiltration and sabotages. We have to actively construct the “three-in-one” anti-infiltration prevention and control system, consisting of ground, air and cyberspace, and put forth great efforts to implement “The New Western Project”. We should strengthen the building up of experimental capability of broadcasting, and carry out the special action of checking and confiscating illegal satellite reception equipments so as to ensure the qualification rate of experimental broadcasting reached over 99%, and in key areas the rate will reach 100%. We will strike hard against separatists who enter Tibet to engage in counter-revolutionary propaganda; we will intensify the supervision and management of new media such as networks and websites. We will also put into effect the practice of having telephone and network clients register with their true identities, and effectively and timely monitor and obstruct reactionary speeches and harmful information. We should try our best to enable the voices and images of the Central Party Committee to be heard and seen in the vast territory of over 1.2 million square kilometres, and prevent voices and images of hostile forces and the fourteenth Dalai Lama’s clique from being heard and seen. We should resolutely struggle against erroneous ideological trends and views. Focusing on seven special topics such as “Constitutional Government and Democracy”, ”Universal Values”, “Civil Society”, “Neoliberalism”, “Views of News” and “Historical Nihilism”, we will form central groups to study these topics and arrange experts to refute mistaken ideological trends and views. In doing so, we will be able to educate and guide the vast Party members, cadres, experts and scholars to have a clear understanding of the essence of the erroneous ideological trends and views and their dangers. Meanwhile, we should strike hard against the actions of attacking leaders of the Party, attacking Socialism, attacking national unity, distorting the history of the Party and history of the country, starting rumours and spreading rumours, slandering and sensationalising on the internet. We should resolutely punish and regulate fake information, violation of rights on internet and obscene and pornographic materials, and guide the websites and netizens voluntarily adhere to the “Seven Bottom Lines” for spreading information on the internet (the seven bottom lines are the bottom line of laws and legal regulations, the bottom line of the socialist system, the bottom line of national interests, the bottom line of the legal rights of citizens, the bottom line of social public order, the bottom line of morality and prevailing customs and the bottom line of the veracity of information).